You want your retractable awning to last as long as possible, so here are some tips to make sure it does! A retractable awning is a great investment because it not only protects your deck or patio from the elements, but you can also put it away and bring it back out with ease. Motorized retractable awnings allow you to retract your awning with just the press of a button! Whether you have a manual or motorized retractable awning, here are some tips to increase the lifespan. An awning is used to protect from the sun, but it is not made to withstand harsh weather conditions. Therefore, when there is inclement weather in the forecast, make sure to retract your awning. 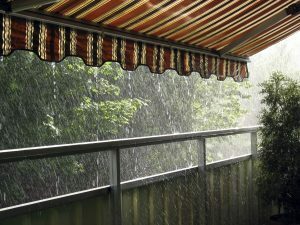 Puddles of water building up on top of the awning can cause the fabric to stretch and become weak. It can also lead to mildew growth. Strong winds can damage the fabric or the retracting part of the awning itself. If the fabric on the awning freezes before you retract it, it can cause motor damage. When opening a manual retractable awning, make sure to turn the crank gently and without forcing it. When it is fully extended, the arms will hold the fabric completely and there won’t be any sagging. The arms of the awning are never fully straight so don’t try to force it because it could cause damage. When retracting the awning, you want to first remove any debris from it. The fabric should roll off the top of the roller tube rather than from the bottom. Though awning fabric is typically water resistant, water can still seep through, so you want to give the fabric time to dry before retracting it. A motorized awning is convenient and operated electronically. If it stops working for any reason, it is probably an electrical issue that needs to be addressed. You probably need to either replace the remote battery, check that all the breakers are switched on, or check that the outlet its plugged doesn’t need to be reset. To increase the lifespan of the hardware itself, you can lubricate it once a year with a dry silicone spray. Contact Carroll Awning Today For Your Retractable Awning!